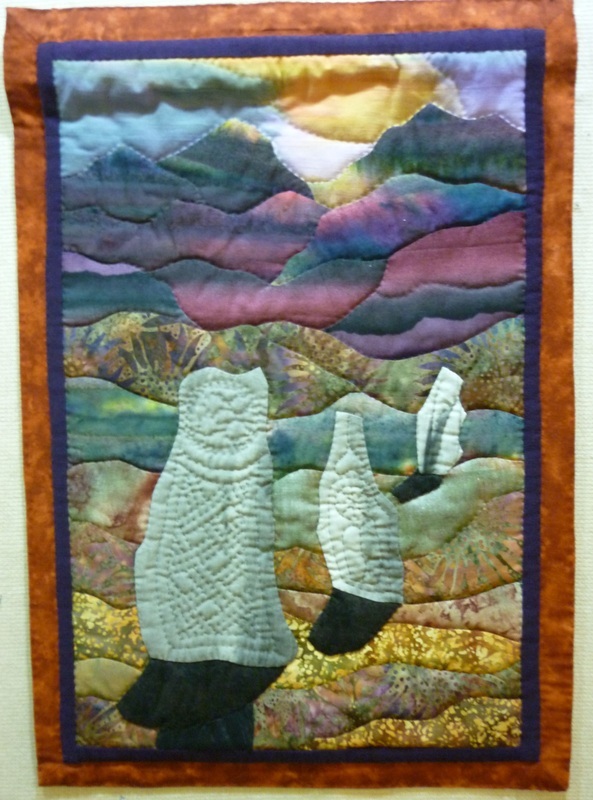 DeAnne was in residence at the Llangollen Royal International Pavilion for the first two week of Quiltfest. She demonstrated her hand stiching skills and talked tirelessly to visitors about her skills. In the first week she was filmed by S4C TV both at her home using her traditional Welsh quilting frame and at the Pavilion talking about her quilts. This is a selection of pictures taken during this exhibition showing Deanne's comments for each quilt. 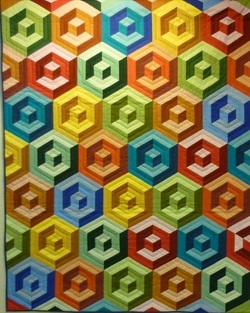 As you go around the exhibition you may have gathered that I like making medallion quilts. I am a big fan of getting the geometry to fit in as the design grows. It is a challenge but well worth it. I use these two small quilts as teaching aids for colours and patterns. 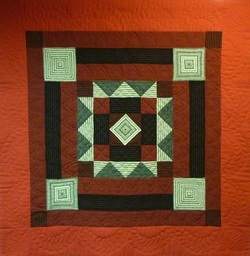 This large Welsh flannel quilt was pieced over papers in order to control the stripes and keep them straight. Careful tacking was required to contrl the piecing. The flannels were bought from local mills and were a delight to work with as I had lovely hands from the lanolin still in the fabric. 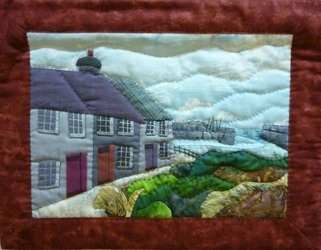 The design was based on an old Welsh wool quilt but I chose different colours. 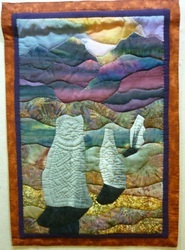 The landscape is foundation pieced using the stitch and flip method of sewing. 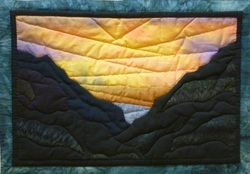 I love my sunsets and my mountains and I had a large cache of fabric to work with in order to create the effect that I needed. I enjoyed using the fabric like a paintbrush. The Inspiration for the colours was taken from the uniform of the Welsh Guards. The design was made up as I went along, the dates being added with gold fabric paint. The quilt is paper pieced and hand quilted. I loved the colours of the Irish Chain so much that I made this quilt in similar shades. 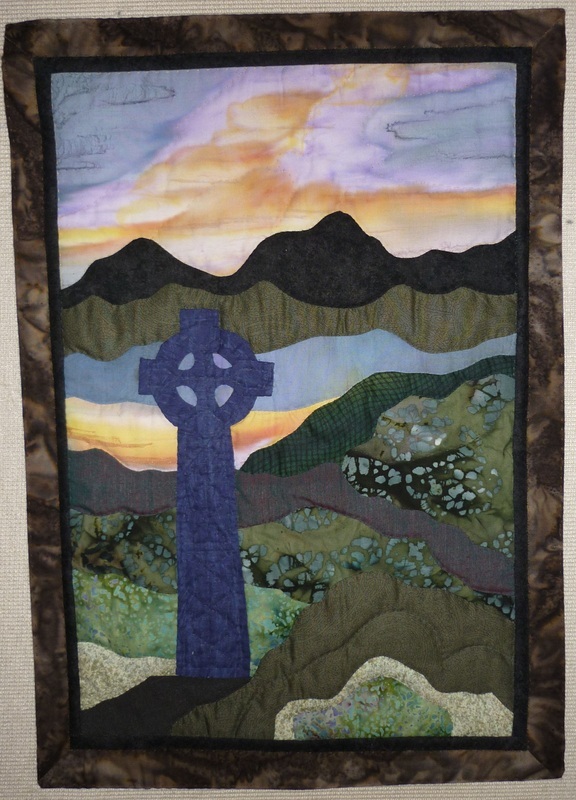 It is paper pieced and hand quilted. 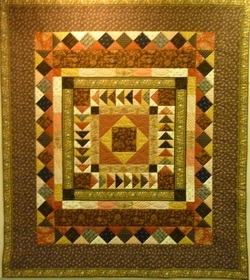 The dark areas of the plates have moved around the quilt to give the impression of the passing of time. The corner designs I made up myself so they fall beautifully over the bed corners. 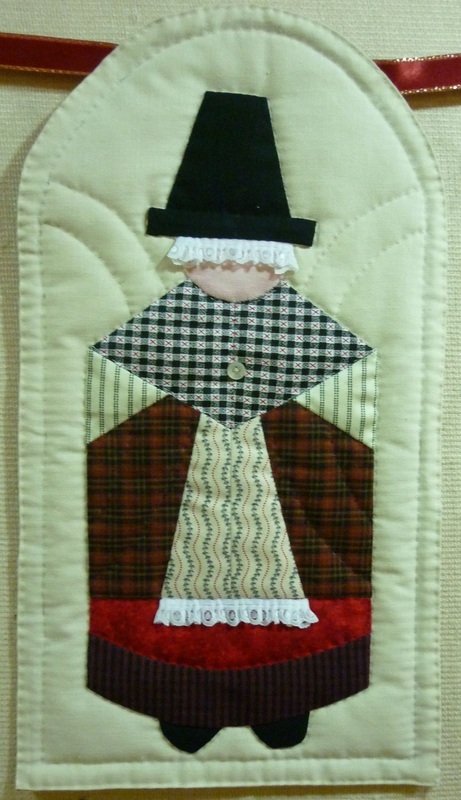 This is based on an old Welsh quilt and is paper pieced and hand quilted. The colours have been chosen to represent the different flannels that were used for the traditional Welsh costume. 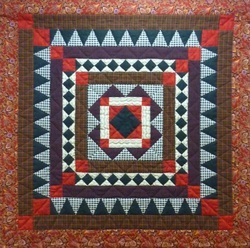 This scrap quilt uses the simple shapes of squares, triangles and rectangles. 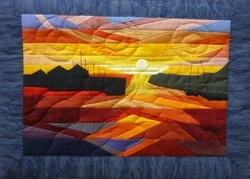 By using warm autimnal colurs it gives a homely feel to the quilt. 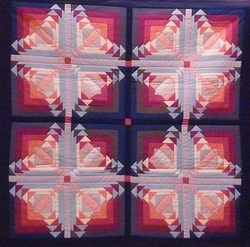 This quilt was pieced during a cricket test match series between England and the West Indies. A scrap quilt using bright colours and bordered with a Victorian cotton velvet ribbon. Simply quilted with circles to represent the cricket ball: a lot of tacking papers can be done during a 5 day test! Various sizes of landscapes. These are also used as teaching aids. Appliqued onto foundation. 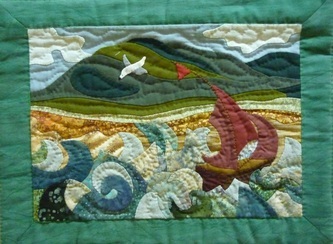 A scrap quilt using plain colours, which gives it quite a dramatic effect. Pieced over papers and hand quilted. This should have been a larger quilt but my daughter liked it so much and wanted it so I made two of them, which reduced the size due to the amount of material I had. I was given a pack of Liberty Tana Lawn and the pink is early Laura Ashley. I had enough fabric to make the main part of the quilt so I only had to find similar colours and prints to make the border. A lovely simple traditional pattern hand quilted with Celtic Knots. 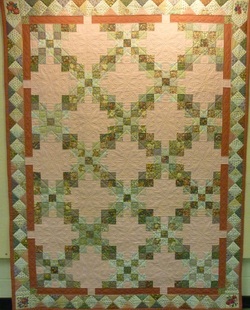 Foundation pieced using stitch and flip and a slightly more complicated design than the basic log cabin.